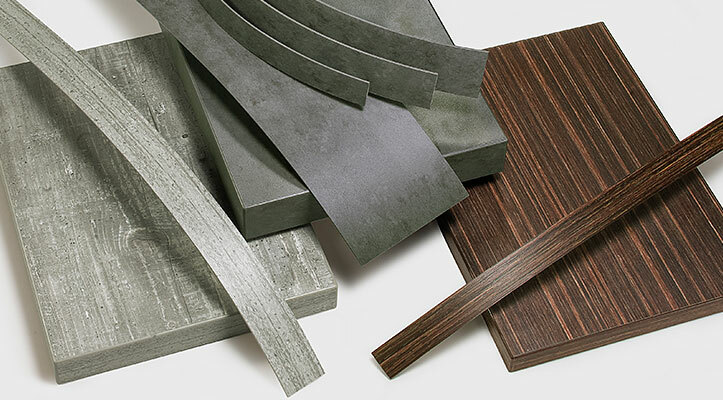 Pfleiderer, one of Europe's leading wood-based material manufacturers, has extended its range and presented the latest additions at the German trade exhibition "Bau". In 2019, there are around 34 new decors, which extend the company’s portfolio offered worldwide. As a long-established partner of Pfleiderer, Ostermann supplies the matching edgings. Among the new decors, you will find cutting-edge reproductions of trend materials, such as concrete, metal, stone and marble. With understatement and nonchalance, they reflect the still fashionable industrial look: ground concrete and smoothed surfaces paired with metals, such as black steel or even glass and rotary cut veneer. Decor innovations such as the silhouetted glass decor “Window”, steel decors or the expressive “Terrazzo Nero” as well as diverse concrete variants represent casual industrial charm. When it comes to wood decors, the trend is for light, natural wood species with balanced, more muted grain and figure. As a long-time partner of Pfleiderer, edgings specialist Ostermann was informed beforehand of the new colour and decor developments. The experts from the product management "edging" got to work with the goal of quickly finding the matching edgings to the 34 new surfaces in order to be able to provide them as soon as possible. And the work has paid off. The new edgings are available in the standard widths 23, 33, 43 and 100 mm, and upon request in any width up to 100 mm. The Pfleiderer Design Collection is available across the world in the same colours and decors. Just like the new extension of the range, the matching edgings are globally available, and can be ordered in the multilingual Ostermann online shop that is translated in 10 languages: with perfect colour matching between edgings and boards. With its familiar fast delivery service for stock articles, Ostermann supplies edgings made from ABS, melamine, acrylate, aluminium and solid wood, in every length starting from 1 metre, and in every width up to 100 mm. Europe's largest range of edgings comprises more than 12,000 edgings to match the board surfaces of more than 70 board suppliers. Always included: the matching edgings to the surfaces of the current Pfleiderer collection! For more info, type in the search item "highlights042019" into the search field on the starting page of the Ostermann online shop (www.ostermann.eu).